I’ve finished the so-called Day shawl! Pattern: Kiwassa by Chrissy Gardiner. Yarn: Schaefer Yarn Andrea in Greenjeans, about ¾ of 1 skein (800 yards). I’m happy to report that Schaefer Yarn’s Andrea behaved significantly better this time around than last – minimal bleeding, and the blocked fabric is soft and supple! I think Greenjeans had the right amount of variegation for this type of shawl – some interest without unnecessary distraction. Needles: Addi Turbo circs, size US 5. Finished size: about 77″ across the top, and 40″ from nape to the point. To me, this is a huge shawl! I just don’t knit them this big most of the time. I can’t remember how many repeats I actually made, but the last few rows, each one bigger than the last, seemed to drag f o r e v e r.
I enjoyed knitting this pattern. I could never remember exactly how the edge stitches were incorporated, so I needed to consult the chart throughout the project. Otherwise, the stitch pattern is very straightforward, and very pretty. And now, the “Night” shawl! I’m already a few inches in, but there are many more to go. Can’t wait to show you! Ooooh thats gorgeous. Can’t wait to see more of your “Dangerous” list get finished. Awesome. It is soooooo beautiful. Total winner. That is stunning. So pretty. This is a very pretty shawl, even though it is large with many repeats, I think I’d enjoy doing it because it looks like the pattern can be memorized. Great job! It is absolutely beautiful! Keep on knitting, can’t wait to see the next shawl off the needles. Congratulations! Hope you have a minute to breathe! That is really beautiful! The photos are great! It came out so pretty! I hope you get to keep it after TNNA! The shawl is stunning! I should get around to knitting up one for myself soon! That turned out so nicely–the yarn is perfect. I love the pattern. You did such a beautiful job! Beautiful! The subtle colors are a nice pairing with the lace pattern. its a really pretty pattern. I like how the shawl uses the same repeat throughout. This is one of the more unique shawls I’ve seen in recent memory–I love it! Beautiful! 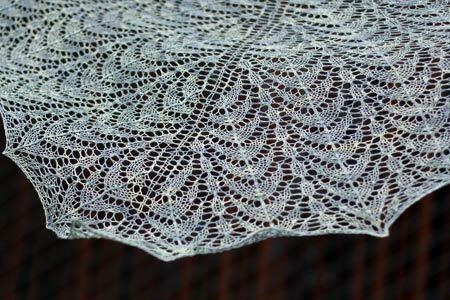 I still haven’t gotten around to knitting a lace shawl yet, and everyone seems to be doing them, it really makes me want to now! Anyway, love it! This shawl seems iridescent! Beautiful. Gorgeous! I love how light and airy it looks, which is a great match for its delicate spring-like color. It’s wonderfully beautiful. this is absolutely gorgeous kathy. delicate and ethereal. i don’t usually go for such large…nor fancy shawls either but for me it is heartening that something this size can be made from 800 yards of yarn. i’m definitely going to have to get the pattern. That is so so pretty! I love it! It turned out so nicely! It’s very airy. I’ve been in the mood for especially airy shawls lately. The combination of the yarn and stitch pattern makes for a beautiful shawl. 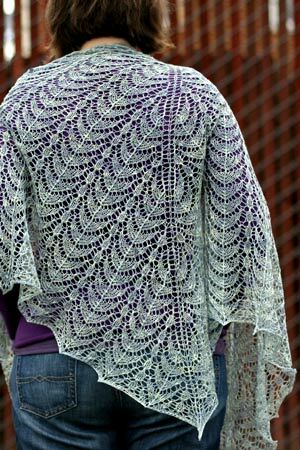 It makes me want to do a lace shawl (but, frankly, I–nor anyone else 3 know–couldn’t pull off the weaing of it). 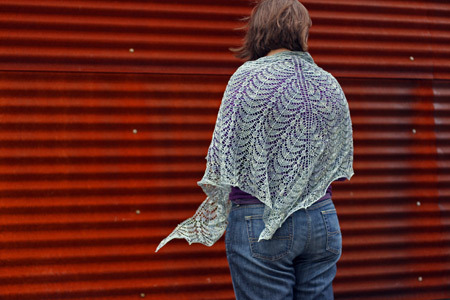 The combination of the yarn and stitch pattern makes for a beautiful shawl. 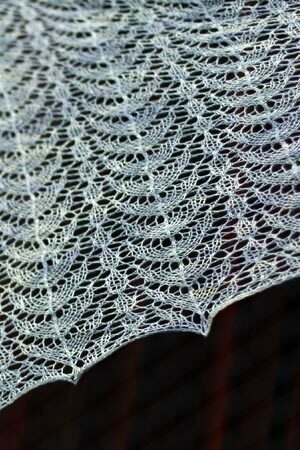 It makes me want to do a lace shawl (but, frankly, I–nor anyone else I know–couldn’t pull off the weaing of it). Oh, Kathy, this shawl is gorgeous. You’ve really outdone yourself even though it was a larger project than you normally make. It’s beautiful! It makes me wish I could finish just one of my shawls.